Toronto based Dominion Citrus is a well established fruit and vegetable importer and distributor across Canada and the USA. 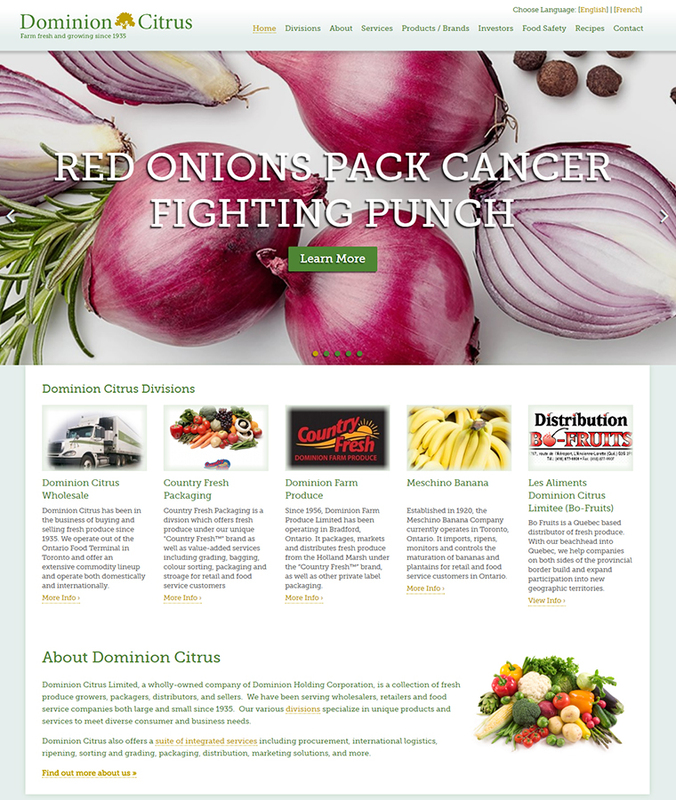 This great looking very graphical website houses the five Dominion Citrus divisions and is successful in effectively showcasing the expertise of each of these. Many of our customers prefer to have their websites custom designed, instead of using a Website Theme. Having a website custom designed for you means that your chosen web design company will follow a structured design process with you with the aim of creating a design that you like and that is exclusively yours. The design process usually begins with concepts being created of the the new website’s home page. From then on, through a process of your feedback and their creativity, the web design begins to evolve. Once you are satisfied with how the complete website looks graphically it is then passed onto the ‘build stage’. This is where your chosen web design transforms into a fully functional website. The entire design stage can take from a few days to several weeks to achieve the right look. JTC OmniblendMoreOn-line retailer of kitchen blenders.